In our examples below, we show how a given transaction affects the accounting equation for a corporation. We also show how the same transaction will be recorded in the company's general ledger accounts. Our examples will also show the effect of each transaction on the balance sheet and income statement. For all of our examples we assume that the accrual basis of accounting is being followed. As you see, ASI's assets increase by $10,000 and stockholders' equity increases by the same amount. 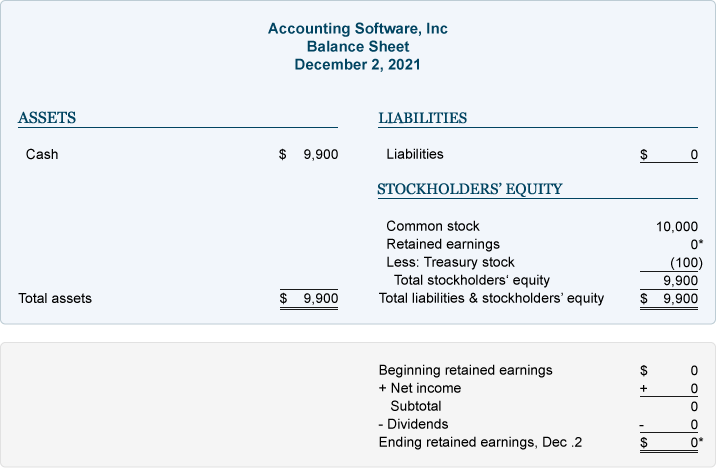 As a result, the accounting equation will be in balance. The accounting equation tells us that ASI has assets of $10,000 and the source of those assets was the stockholders. Alternatively, the accounting equation tells us that the corporation has assets of $10,000 and the only claim to the assets is from the stockholders (owners). The purpose of an income statement is to report revenues and expenses. Since ASI has not yet earned any revenues nor incurred any expenses, there are no transactions to be reported on an income statement. The purchase of its own stock for cash meant that ASI's assets decrease by $100 and its stockholders' equity decreases by $100. The totals indicate that ASI has assets of $9,900 and the source of those assets is the stockholders. The accounting equation also shows that the corporation has assets of $9,900 and the only claim against those resources is the stockholders' claim. The purchase of a corporation's own stock will never result in an amount to be reported on the income statement.